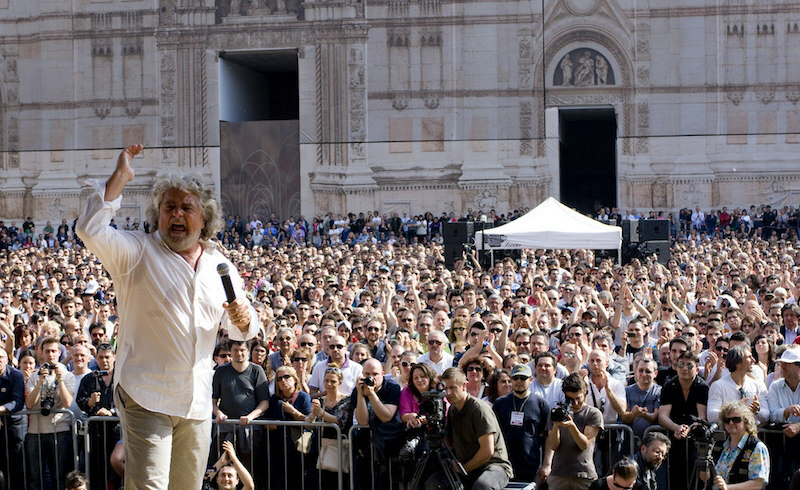 Beppe Grillo address a Five Star Movement rally in Piazza Maggiore, Bologna. May 7, 2011. Photo: Kirsten de Graaf. via Flickr. In June 2016, David Broder spoke with Chuck Mertz of This Is Hell! radio to provide background on the scattered ideology of Italy's populist Five Star Movement. In light of Sunday's Italian elections, which saw M5S capture 32% of the vote, we present that interview below — along with a transcript prepared by Ed Sutton and first published at Antidote Zine. A new right-wing group did very well in Italy’s recent election and is apparently the only alternative to the scandal-riddled government being offered to the Italian voter. What does Italy’s Five Star Movement represent? And why is the far right’s popularity growing in Italy? Here to explain, translator David Broder wrote the Jacobin article “Losing Ground: Italy’s xenophobic Five Star Movement has capitalized on the left’s weakness to emerge as the lone voice of anti-establishment voters.” David is also a member of the Historical Materialism editorial board. He lives in Rome, where he is speaking to us live. He is researching a PhD on dissident communists in the Italian resistance. Welcome to This is Hell!, David. David, the New York Times ran a full-page feature last month which argued that Europe is shifting to the right, except for Spain and Portugal. It was a profile of twenty different countries, eighteen of them showing electoral shifts to the right. Back in April, we spoke with Yanis Varoufakis, the former finance minister of Greece, and he was really worried, predicting that there would be a shift towards the far right in Europe. Is Italy part of an EU-wide shift to the right? Or is it even appropriate to look at this as an EU-wide shift to the right? Should we be focusing rather on the individual campaigns and battles that are happening throughout Europe? What we can say is that across Europe there is declining support for traditional parties of both center-left and center-right, and that in most countries this has led to a rise in support for the far right as the populist alternative — even as we’re seeing heavy budget cuts, high youth unemployment, and people thinking that this generation isn’t going to do as well as the last. In most European countries, that has led to a rise in hostility towards immigration, as well as a rise in hostility towards the idea of “wasteful public spending,” and so on. However, whereas Varoufakis is right to say this is a very worrying development and one which poses huge problems for the left, in certain countries — and particularly in southern European countries — there has also been the rise of left populists outside of the traditional establishment (obviously, Syriza in Greece and Podemos in Spain). The Italian case is interesting, because it’s not just reducible to the far right. I wouldn’t say that the Five Star movement, the party on the rise in Italy, is straightforwardly right wing. It essentially rose as a movement against the political class and establishment corruption and so on. It’s quite heterogeneous, because it’s run as a direct democracy, and online. And it has been very opportunist. In different cities, it takes quite different positions. Overall, it’s probably not governed by xenophobia to the same extent that some other populist movements are elsewhere. Still, that is definitely an element to its coalition of support. When we interview people who are involved in Barcelona en Comú or Nuit Debout, or people in the past who were involved in Occupy, I always wonder what would happen if we had a direct democracy movement and it pointed the community towards the right. Is that what’s happening within Italy and the Five Star movement? That a direct democracy movement is coming to Italy, except it isn’t coming to the conclusions that many who want to start that kind of thing might have been hoping for at the beginning? That’s certainly the case. Of course it’s particularly true in the Italian case. Take the example of the Squares Movement around 2011, imitating the occupation of Tahrir Square in Cairo — in Spain, that gave rise to the Indignados movement. We’re seeing something similar now in France with Nuit Debout. But in Spain and Greece those direct democracy movements, with their ideas of a direct, unmediated democracy without representatives and so on, evolved into more traditional forms of representation. Both Syriza in Greece and Podemos in Spain, while not exactly classic political parties, are very informed by the movements — but certainly they’ve left behind the anarchist spontaneity they had in 2011. In Italy, the idea of direct democracy was never associated straightforwardly with anti-austerity movements the way we have seen in other countries. It’s still a rejection of the existing political structures, but posed more in terms of distaste for establishment corruption. This call for democracy doesn’t have any necessarily leftist or progressive content. Another example would be in Britain right now. We’re having a referendum on EU membership. Everyone gets to vote, and it’s a direct decision without being mediated by parties and so on, but the tendency has been towards shrill claims about migration and so on, very badly informed public debates. That’s actually quite frightening, to see the way things are getting out of hand. I don’t think direct democracy necessarily leads towards progressive social policy. But it does reflect the fact that large sections of the population feel left behind, excluded from traditional representation. In Italy there is forty percent youth unemployment. Young people who have never had a job are not going to identify with trade unions or with the old left parties as standing up for people like them. So it’s natural that they look for alternative solutions, and that’s what the Five Star movement represents. When we talk about these alternative solutions, is the reason that the alternative solution in Italy is different from those in Spain and Greece is that in Italy there is a prioritization of fighting against establishment corruption? Is establishment corruption what drives Italy’s alternatives more to the right than what we’re seeing in Greece and Spain? I definitely think so. In a sense, although the corruption of the Italian political class is very much a reality, there is something more conservative in the very idea of anti-corruption. There is a certain tendency to have a vision of returning to some mythical past when things worked properly. A slogan often in the mouths of Five Star movement activists is the idea of Italy being a “normal” country. This tends to lead to a certain antipathy towards things like public services that don’t really work. In Greece and Spain, there’s a much stronger element of having a positive political alternative, like the idea of a more generous social democracy, whereas the Five Star movement doesn’t really have any positive program at all. It is very heterogeneous coalition. For example, in the run-off vote for the Rome mayoral election, which the Five Star movement will almost certainly win, I have lots of comrades who are communists who are planning to vote for the Five Star movement because they hate the establishment party, the Democrats, which is prime minister Renzi’s party. Meanwhile almost all the far right is also lining up behind the Five Star movement. The previous mayor, Gianni Alemanno, who is a lifelong fascist and still on the far right, is saying he’s going to vote for [Virginia] Raggi of the Five Star movement, because she stands against the political class who don’t care about ordinary people. But the discourse of the Five Star movement lacks any defining positive element of its own. It’s more governed by hostility towards elites. And as it happens, the elites we have, at least at the moment, are liberals. That often gives the the focus of Five Star’s campaigns and slogans a quite right-wing direction. Essentially M5S sees antifascism as just one more part of the liberal establishment’s effort to silence ordinary people. The success of the party does tend to introduce pro-fascist and anti-immigrant themes into a general political debate, which is something that the left needs to avoid. Do the people of Italy, then, create their own Five Star movement in their mind the same way so many people here in the US who voted for Barack Obama imprinted their own feelings upon him, things that weren’t necessarily the case? Is there the same kind of imprinting of people’s values on the Five Star movement? Does the Five Star movement mean different things to different people? Absolutely. The idea of being against entrenched elites, or against corruption, or for honesty in politics is a very broad idea. In last year’s Mafia Capitale scandal, all of the establishment parties, together with far right terrorists, politicians of left and right — all of them — were caught together in the same corruption, stealing more than a billion euros in city funds. To stand against that is an easy position to take. But the Five Star movement is organized on a local basis as well, so its groups in different cities tend to have quite different positions from each other, depending on who the party of the local government is. So you can project onto it whatever you want. The movement very rarely takes strong positions on issues. For example, the Democratic Renzi government has introduced all sorts of gay rights legislation. Italy had never had any specific gay rights legislation before, and the government wanted to bring in gay civil partnerships and also give gay couples the right to adopt, with the so-called “kangaroo clause” (surrogate mothers for gay couples). Similarly, Renzi recently made it so children of migrants born on Italian soil would have automatic Italian citizenship. On these kinds of divisive social issues, the Five Star movement just doesn’t take positions, and almost all of its MPs and senators abstain, because of course if they took a firm position either way, it would undermine its ability to be a catch-all party or a cipher for people to project onto it whatever they want. It’s even cleverer than that, because for example with the gay rights measures, the Five Star movement MPs who abstained used opposite arguments for their reasons to abstain. Some said it doesn’t go far enough (the government isn’t serious about introducing gay marriage and equal rights for gay people and so on), whereas others were opposed to it entirely from a Catholic reactionary family values point of view. So the movement succeeds in sending out completely opposite messages to different constituencies of voters so it can please everyone all of the time. Of course, the fact that it hasn’t actually been in government (except for some local mayors) means it’s easier for it to maintain this nebulous position and refuse to take firm positions of its own. To what degree, then, is the Five Star movement a cohesive movement? It doesn’t have a coherent positive political program of social reform. It’s held together by its opposition to the establishment parties. There is an online direct democracy platform to decide its policy positions, but these are often just replaced with abstention as the easiest thing to do when push comes to shove. The one thing that does hold it together is its leader, Beppe Grillo. Grillo is a former comedian, and he set up the party originally as local circles called the Friends of Beppe Grillo. The idea of the party was that although he isn’t in parliament (and indeed isn’t allowed to stand for parliament because of a manslaughter conviction), he acts as the guarantor of its constitution and its democracy. In practice, he’s given to outlandish public statements. You might call it trolling the political class, or violating the standard codes of conduct in Italian democracy, the standard limits of what it’s acceptable to say. For example, proclaiming that he isn’t an antifascist, being willing to open up dialogue with fascist social centers like Casa Pound — this is all way outside the norm of Italian democratic politics. But because he isn’t formally the leader, Five Star movement activists are given to dismissing what he says as just a joke or saying it doesn’t determine the party’s policy. It’s very hard to pin them down on anything, and makes it quite frustrating to oppose them politically. You mentioned how some on the left might end up backing Five Star candidates in the upcoming elections. What might those on the left regret about voting for the Five Star movement as a protest vote against the Democratic party? I understand the motive to kick the Democrats, certainly. Though most of its membership and leading personnel originated in the old Communist party, it has now transitioned to being a party of the center-right, albeit one without much of an opposition — very neoliberal, very managerial, very determined to kick the trade unions and so on. So there are a lot of reasons to protest-vote against it and try to break up its base of support. There’s also the advantage that if the Five Star movement actually does come into office then it will be exposed for what it is, which is a party with no political solutions at all and very limited progressive credentials. However, I think the risk of them coming to power is that they tend to give political space to far-right groups. So even if they’re not themselves a far-right movement, they tend to legitimize them and to say that right-wing discourse and “concerns” need to be brought into public debate. Part of this, of course, is to keep the far right within the Five Star movement’s own voting coalition. For example, the Rome mayoral candidate for the Five Star movement, Virginia Raggi, has said that there should be a “registry of gypsies.” Her politics aren’t governed by xenophobia, but she tends to make concessions to it. Also, Grillo has had televised meetings with representatives of Casa Pound, which is an openly fascist group. Essentially the party sees antifascism as just one more part of the liberal establishment’s effort to silence ordinary people. So the success of the party does tend to introduce pro-fascist and anti-immigrant themes into a general political debate, which is something that the left needs to avoid. You were mentioning how the ruling party of prime minister Renzi, the Democratic party, has been focusing recently on gay and migrant rights, and that led me to thinking about another aspect of your writing, which is the way the Italian Democratic party has embraced the Democratic Party of the United States. How are these parties similar? What is the Democratic party of Italy trying to replicate that is taking place in the Democratic Party here in the US? The one thing they’re definitely not trying to replicate is something like Bernie Sanders. The Democratic party of Italy is a merging of the old Communist party — which went social-democratic after the fall of the Berlin Wall, the end of the Soviet Union and the end of the Communist parties — with various fragments of the other parties which collapsed around the same time. Basically, in the Cold War period the existence and threat of the Communist party, the second-biggest party in the country, had held the Christian Democrats (a very broad, big-tent party of the Italian center-right) in government permanently for fifty years. Then when the Communists collapsed, the Christian Democrats collapsed too, creating all sorts of small centrist fragments. At the time, these centered in the Democrat party, and made it the centrist, big-tent party. That was the idea of the Party of the Nation, as it calls itself. It’s been progressively getting rid of its former leftist associations. The Italian Communist party was governed by the tradition of Gramsci and, in a sense, of Lenin — a Marxist politics, even if in practice it was more like a reformist social-democratic party. The shift that’s taken place in the Democrats in the 25 years since the end of the Soviet Union has been to consciously imitate the US Democratic Party, removing any Marxist or leftist reference points. In Italy, historically, “Liberalism” has been mainly a current of the right, and they are now trying to appropriate that ground as a pro-business party, a neoliberal party, a managerial party which mainly defines itself against the right in terms of culture wars or social policy. As I say in the article, for a long time the Democrats’ electoral support was mostly held together by hatred of Silvio Berlusconi — a crass sexist and racist figure, with his media monopolies and so on, a very detestable figure and very easy to mobilize people against. The Italian constitution, historically, has always allowed for representation of a lot of parties in parliament, because it supports a certain degree of proportional representation. What Matteo Renzi, the current Democrat leader, has tried to do in particular is create something more like the US system, where effectively there are only two parties, and therefore the party is effectively free of pressure from its left, because all that matters is electoral competition from the center-right. The constitutional referendum which will take place this autumn is the Democratic party’s attempt to realize that. Essentially what it wants is for itself to represent the left and Berlusconi to represent the right, because then it will always win, and be free of pressure from mass movements, social movements and so on. The US political system is more elitist and undemocratic, in that sense — that’s what he’s trying to create. In Italy, there was an enormously strong Communist party from the forties to the nineties. More than two million members. They ran co-ops including seven or eight million people. They were consistently the second party, for decades. In the early nineties, with the collapse of the Soviet Union, it just fell apart, and that destroyed a huge swathe of the institutions of the left in Italian society. But the argument is, at least from prime minister Matteo Renzi’s position, is that this constitutional reform will fight corruption. It doesn’t sound like it will fight corruption to me. It sounds like it will cordon off the political power to two different political parties. So how will this fight corruption within the Italian government? And why would Renzi bring up this kind of constitutional reform when it seems like his party is not in such a powerful position? The argument that it would combat corruption is really nothing but a poor and transparent attempt to show that he’s listening to concerns about the corruption which pervades Italian political life. If anything, I’d say that the reduction of the number of parties would tend to encourage corruption. Historically, the Christian Democrats were permanently in government, from the forties to the nineties, and there were enormous corruption and patronage networks because the party could use the state as its personal possession, distributing tenders for contracts and building works and so on, jobs in the civil service. The stabilization of the Democrats as a “natural party of government,” as the constitutional reform seeks to achieve, would entrench and expand corruption, because it would make the system generally less democratic and less subject to scrutiny. As far as why he’s doing it now: this has been a long time coming. It’s really been in the works for ten years, and it’s been three years since the current electoral system was actually declared unconstitutional — which is quite bizarre in a way, to have a government elected by an electoral system which is deemed unconstitutional, itself implementing a constitutional reform. But the Democrats’ position isn’t all that weak. While it’s suffering heavy losses to the Five Star movement now, what we’ve really seen is the collapse of the traditional conservative right. The Democrats are the only party that exists that has been in government. I think Renzi should be worried about the collapse of Berlusconi, in a sense, because it’s more difficult for him to create the system he wants without Berlusconi as the opposite pole. It’s much better for him, with only two parties, if Berlusconi is the only opposition. That’s what I was going to ask next: could the Five Star movement create a farther-right-wing party than Berlusconi’s party, while the Democratic party is still focused on Berlusconi? I think that’s certainly possible. Berlusconi, when he was in government in the mid- to late nineties, dropped elements of the far right into his coalition, and they are now splitting in favor of the Five Star movement. However, I wouldn’t say that the Five Star movement is simply far-right, or to the right of Berlusconi. It also has an enormous capacity to attract what we might imagine to be more left-wing constituencies: young people, unemployed people. Also, its program and its positions (it has taken some) contain some ecological thinking. That’s the interesting thing about it: it’s not a traditional right-wing party. Its language and its membership probably wouldn’t even see themselves as right-wing — it claims to “replace left and right.” The idea is, “We represent the people, and not a part of the political class.” That’s part of its success. Can neoliberalism be defeated in Italy without the help of the far right? I don’t accept the premise of the question, since I don’t think the far right are really an anti-neoliberal force. The previous mayor of Rome, Gianni Alemanno, was a former fascist. He used to be the leader of the youth wing of the fascist party the Movimento Sociale Italiano, which was a party in the sixties, seventies, and eighties that got about ten or fifteen percent of the vote. A lot of his intellectual formation, and a lot of his support, was indeed from the anti-capitalist far-right — the idea of a socialized economy, getting rid of private interests, a heavy interest in a tax on banks and institutions like the International Monetary Fund. Yet in practice, as mayor of Rome, he joined the center-right. He was allied to Berlusconi. So the claim that the far right makes that it is against neoliberalism is quite opportunistic. In practice they are closer to the center-right than they are to the left. It’s difficult, because there aren’t very strong social movements in Italy now, and politics tends to run more along the axis of liberal elites versus populism. I don’t think the Movimento Cinque Stelle is really an anti-neoliberal party. In some areas, it’s supported campaigns against hospital closures and so on, but in the few towns that it’s governed, it’s actually implemented quite heavy budgetary cuts. I don’t see it as much of an ally against neoliberalism. In the run up to the Roman mayoral election, Five Star Movement senator Paola Taverna claimed that the [socially liberal] PD and [conservative] FI party put up weak candidates to ensure that M5S would win. Their scheme, she says, was to make her party "economically dependent" on the national and regional governments run by the centrist PD, then cut off funding and "make us look bad." Widely reported as a gaffe, Taverna’s pre-election comments are characteristic of the self-declared anti-establishment party’s conspiracy theories. So Taverna claimed the conservatives and social liberals threw Rome’s mayoral elections in order for the social liberals to make the Five Star movement look bad? How is this characteristic of the anti-establishment party’s conspiracy theories? Are conspiracy theories a typical part of their rhetoric, or Italian political rhetoric in general? Yes to both. They are. Part of Italian political life, far more than in other countries, is accusations of elite conspiracies crossing party divides. The thing is that often, conspiracy theories which sound very implausible are ultimately proven to be true. The biggest one was Operation Gladio: after World War Two, there was collaboration between the state, far-right terrorist groups, and the CIA to attack the left and to keep structures in place so they could mount a coup if the Communists ever came to power. This sounds fanciful, or even self-aggrandizing for the people who promote such theories. But ultimately the Christian Democratic prime minister admitted that it indeed did happen. More recently, we saw the Mafia Capitale scandal. The Five Star movement says all of the parties are the same (implicitly, they are not one of the parties). They say they are are all doing it together, the center-left and -right, they are just lining their pockets. Hey Presto! It’s true: both the PD and Berlusconi’s party were stealing more than a billion euros from the Rome city government per year. So these conspiracy theories often sound untrue, but are then proven correct. But in a general sense, intellectually, the Five Star movement is heavily governed by a conspiratorial way of thinking. Their original theorist, Gianroberto Casaleggio, who was the right hand man of Beppe Grillo and the editor of his blog (he died recently), was the brains of the operation, and he produced a video called Gaia which is very similar in tone to something like the Zeitgeist movies, putting forward this idea of a globalist conspiracy coordinated by the Bilderberg group — there’s a plan for global world government, the total destruction of democracy — along with the idea of alternative currencies as a way of escaping from what the establishment is doing. The Five Star movement’s approach to politics — which is to see democracy as being corrupted and betrayed, so what we need instead is honesty and clear-sightedness — lends itself to a conspiratorial worldview. It doesn’t talk about things like austerity or the idea of a shift in the balance of class power. It doesn’t really have any analysis of what’s going on in the world or the changes in Europe at the moment. It just reduces everything to bad politicians lining their pockets. In that sense it’s a party very heavily governed by conspiracy theory. What does the Five Star movement (and its success) reveal about Italian politics that may be different from countries like Spain or Greece? What should the Five Star movement tell us — especially as observers from the US — about Italian politics? There are two things. One, Italian society and culture is very individualistic and has much less of a strong element of things like public services or collective responses and solutions to problems. But the second thing is the real difference with the other countries you mentioned. In Italy, there was an enormously strong Communist party from the forties to the nineties. More than two million members. They ran co-ops including seven or eight million people. They were consistently the second party, for decades. In the early nineties, with the collapse of the Soviet Union, it just fell apart, and that destroyed a huge swathe of the institutions of the left in Italian society. In other countries — Portugal, Greece, Spain — they had military dictatorships up until the seventies, and then there was a kind of left social democracy for a couple of decades, and now there are left alternatives emerging. But the demoralization following the collapse of the Communist party still shapes all aspects of Italian political life. I really appreciate you being on the show with us this week, David. Thank you so much.